Continue reading Legislative Round-Up: Week Ending June 29, 2012. The independent Palestinian polling firm AWRAD (Arab World for Research & Development) this week published a new poll of Palestinian students in West Bank campuses that recently had student council elections. Poll results show - among other things - that among West Bank students, the Palestinian governments' approval ratings (both that of the Fatah-led government in the West Bank and that of the Hamas-led government in the Gaza Strip) are very low. Continue reading APN Interns on the significance of AWRAD poll. The evacuation of the five illegally-built houses in the West Bank settlement of Beit El was completed without any confrontations between the settlers and the police. The 3,000 police officers who just a week ago spent an entire day in the Jordan Valley, practicing the evacuation of a violent crowd, did not stretch a muscle. Continue reading Low-key Ulpana Evacuation. As part of the political crisis around the Ulpana Hill outpost, PM Netanyahu announced a "compensation package" for the settlers in which 851 new units will be built in disputed areas in the West Bank. Continue reading The Huffington Post: The Compensation Package for the Settlers: 851 Units to Undermine the Two States Solution by Peace Now's Hagit Ofran. Alpher discusses how we should we understand the situation in Egypt, whether Mofaz's, leader of the Kadima party who recently joined the Netanyahu government as a deputy prime minister, visit to Washington last week where he promoted his ideas for renewing the Israeli-Palestinian peace process points the way toward some sort of new peace initiative, and if the new enlarged and more "central" Netanyahu coalition might constitute a first step toward a Likud-Kadima-Atzmaut union and a pragmatic peace plan. Continue reading Hard Questions, Tough Answers with Yossi Alpher - June 25, 2012. Extremist settlers are escalating their campaign to resist Israeli government attempts to remove five illegally built houses at the West Bank settlement of Beit El, near Ramallah. As government representatives seem to be inching toward an agreement with settler leader to peacefully evict the houses, some of the more militant settlers are escalating their actions and rhetoric to try to hinder the eviction. 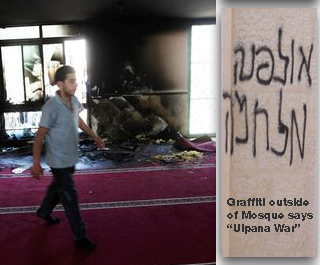 Continue reading Settlers Escalate Ulpana Resistance; West Bank Mosque Torched. VIDEO: Israeli Soldier Testimony from "Breaking the Silence"
The first videotaped testimony from the "Dis-Cover the Occupation" campaign of the Israeli organization Breaking the Silence has a soldier recalling how he witnessed settler children burning a Peace Now effigy. Watch this from among the 800 testimonies given by Israeli soldiers after serving in the occupied territories. Continue reading VIDEO: Israeli Soldier Testimony from "Breaking the Silence". What do you call a unilateral "withdrawal" that leaves Israeli settlers and soldiers behind? The answer: Continued occupation. With Israeli-Palestinian efforts at an impasse and immediate-term hopes for progress toward any agreement fading, the appeal of new ideas is understandable. This is no doubt why discussion of Israeli unilateral options--generally in terms of unilateral "withdrawals" from the West Bank--is in the air. Continue reading Daily Beast: "The Siren Call of Israeli Unilateralism" by APN's Lara Friedman. Israel State Comptroller report on the decision-making behind Israel's actions against the Gaza Flotilla? Improvement in Israeli national security decision-making since Hamas took over the Gaza Strip? Factors for Israeli strategic thinking regarding Gaza in the near future? Egypt and the presidential election runoff -- does this end the revolution? Continue reading Hard Questions, Tough Answers with Yossi Alpher - June 18, 2012. Continue reading Legislative Round-Up: Week Ending June 15, 2012. -- A few weeks after Israeli Independence Day, and just days after June 5, that symbolic date on which the Six-Day War erupted 45 years ago, I am sitting on my own in the alleyways of the Tulkarm refugee camp to write this column. I am writing to you from this refugee camp, in which I grew up and became a warrior against the occupation, I am now writing to you in the spirit of liberty, peace and tolerance. Continue reading A Message of Peace from Tulkarm. On June 7th, APN Spokesperson Ori Nir was interviewed by Washington, D.C. Pacifica Radio-affiliate WPFW about failed attempts by Israeli extremist lawmakers to "legalize" settlement construction on privately-owned Palestinian land. APN Board Member Letty Cottin-Pogrebin last month published an opinion piece on the Daily Beast's Open Zion blog, suggesting the appointment of former President Bill Clinton as a special presidential emissary for Israeli-Palestinian peace. Continue reading Bill Clinton to APN Board Member: I will Continue to Support Peace. translated by Israel News Today, no link. -- A number of years ago a few dozen Israeli families bought subsidized apartments in a new project on the edge of an existing neighborhood. They recently learned that the contractor had used hazardous construction materials and, as a consequence, the building had to be demolished. The owners of the apartments, some of which are rented out for sizeable sums, were offered new apartments that are more spacious and better fitted, that will be built for them on a different plot in the neighborhood. They vehemently reject that offer: we will not leave our apartments, we will not give up our rights. Our current apartments are embedded deeply within our hearts. This is our land. Our opinion is firm--we will not move to new apartments that are even a mere 500 meters from the old ones. Continue reading The Right to Reside and the Right of Return. 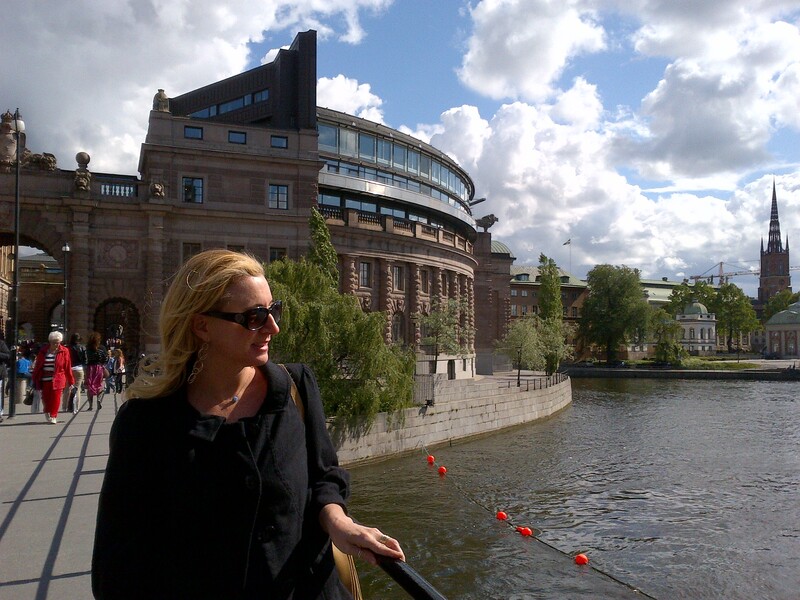 My colleague Lara Friedman, APN's director of policy and government relations, returned from Stockholm over the weekend after two days of discussions co-sponsored by the Swedish National Defense Research Organization (akin to the American RAND Corporation) and Princeton University's Liechtenstein Institute for Self Determination. The topic of the discussions was U.S., Israeli, and Swedish (and European) perspectives on the Iran nuclear crisis. Participants included several prominent Israelis, former senior U.S. military officers, and members of the Swedish foreign policy and national security community. Lara told me that the discussions were "fascinating yet sobering, underscoring the sharp disconnect that exists between American/European views of the Iran challenge on the one hand, and the views of many in Israel, on the other hand. Lara said that the discussions "highlighted divergences with respect to both the interests and risks involved in the various options available, particularly as related to potential Israeli or U.S. military action against Iran." Lara closely follows US Iran policy, particularly as it plays out between the administration and Congress. She is considered one of Washington's leading experts on this issue. VIDEO precedes the Q and A. Yossi Alpher visited the Peace Now offices in DC last week, as Israel marked 45 years since the West Bank, Gaza Strip and East Jerusalem were captured in the Six-Day War. Continue reading Hard Questions, Tough Answers with Yossi Alpher - June 11, 2012. Neve Shalom ("Oasis of Peace"), a small community in which Jewish and Arab Israeli citizens choose to live together, was vandalized last night, apparently by settlers or settler-sympathizers. Graffiti saying "Death to the Arabs" was sprayed on Neve Shalom's bilingual school. Several cars were vandalized with hateful graffiti. The tires of fourteen cars were punctured. The attack on the this community of peace, halfway between Jerusalem and Tel Aviv, was similar in nature to past so-called "Price Tag" attacks by extremist settlers and their sympathizers against Palestinians and Israeli peace activists such as Peace Now's Yariv Oppenheimer and Hagit Ofran. Continue reading APN outraged at vandalism of Oasis of Peace. 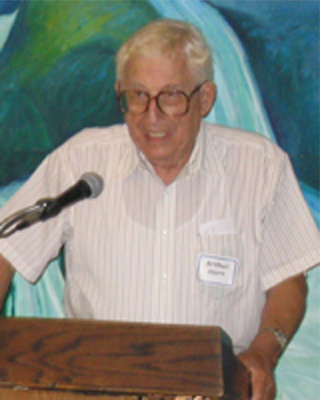 Arthur Stern, pictured right, was an APN Board and Executive Committee Member, and SoCal Regional Co-Chair. He recently passed away and as per his request, fellow APN leader Sandy Weiner gave one of the eulogies. Continue reading Eulogy given by Sandy Weiner at Arthur Stern's Funeral. Ma'ariv: "Confronting the Lords of the Land"
...His name is Yariv Oppenheimer (Peace Now Secretary General), and he drives the settlers mad because he has succeeded time and again in placing a few boundaries for this band of people, who are certain that the entire area beyond the Green Line is their private domain, and they can do with it as they please without interference. Continue reading Ma'ariv: "Confronting the Lords of the Land". The ugly reports keep rolling in. A rally against African migrants turns violent and a race riot ensues; the whole thing is repeated a week later. A Jewish-Israeli of Ethiopian descent is "mistaken" for a migrant and assaulted in Tel Aviv. A group of teenagers in Tel Aviv is arrested for a series of brutal, racially-motivated robberies and assaults targeting Africans. A Sudanese man is viciously beaten in Tel Aviv. A Sudanese hotel worker is nearly lynched in Eilat. 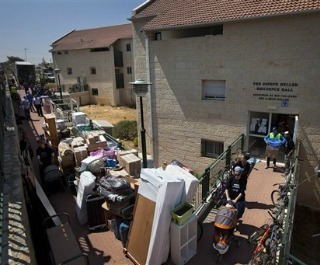 An apartment in Jerusalem is torched with 10 Eritreans trapped inside. Continue reading Where the Racism Comes From (LFriedman at The Daily Beast). A few weeks ago, Americans for Peace Now sent out my letter asking you stop being defensive about what our adversaries say about us. They have been accusing us of all kinds of nonsense - when actually, APN and our sister organization Shalom Achshav, have been working for the only possible solution that will lead to peace and security for Israel. If you want to see what effect we are having, read this editorial published yesterday by the editor and columnist Yael Paz-Melamed for the Israeli daily Ma'ariv. Continue reading Hold my feet to the fire: A letter from James Klutznick. "Building 300 housing units in Beit El and expanding other settlements are not a punishment to Peace Now but a punishment to all the citizens in this country..."
Earlier this week, Prime Minister Netanyahu was quoted with regard to the litigation of Peace Now and other organizations, that they should know for every illegally built structure in the settlements that he will be compelled to demolish by court order, he will build ten. In response, Peace Now published an open letter to him as an ad in the Hebrew media, and is collecting signatures to be sent to the Prime Minister. Continue reading Peace Now Letter to PM Netanyahu. My heart recently filled with pride at the sight of my fellow APN Board Member, Mandy Patinkin, addressing a crowd of 700 mostly young Israeli peace activists at a conference organized in Israel by the Peace Now movement (Shalom Achshav). Mandy told them how their efforts inspire progressive American Jews and reinforce our belief that there could be a strong, secure and just Israel, living in peace with its neighbors. Continue reading 45 Years Too Many. Continue reading Hard Questions, Tough Answers with Yossi Alpher - June 4, 2012. This op-ed is a response to a column by David Suissa. To read his piece, click here or see his response. David Suissa wants us to believe that settlements aren't an obstacle to peace because their physical "footprint," their built-up area, represents "only" around 1% of the West Bank. Continue reading "David Suissa's settlements crisis" by APN's Lara Friedman.